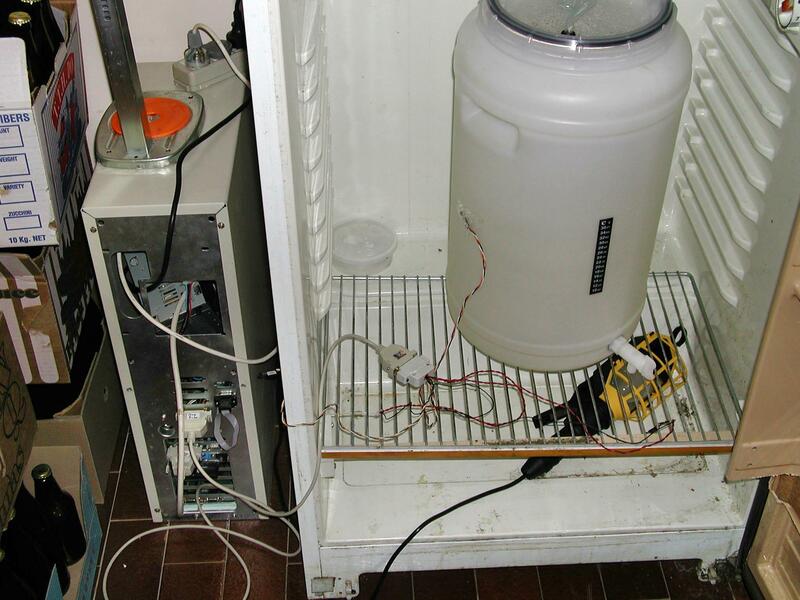 This page describes the methods I used to use to keep the temperature constant when brewing beer. It's the second attempt; the first attempt was seriously suboptimal and worked quite badly under some circumstances. For blow-by-blow details of the problems and issues I had setting up this control system, see my brewing log. I wrote this page in June 2004, and much of it still reflects the conditions at the time. As of November 2011 I'm in the process of updating it; this status paragraph will show how far I have got. I have presented a paper on this system at GUFIcon#6, at Linux.conf.au 2006, at BSDCan 2006, and at Grain and Grape in Melbourne. The link is updated as I present the paper. There are also some slides. An old computer, of course. The size of the one I chose is simple: that's what I had left over. It's an Intel 486-DX2/66 with 16 MB of RAM, something you can probably pick up for free if you know where to look. It's running FreeBSD, of course. The power supply is not the original, and it's not (just) out of laziness that it's not screwed to the frame: it's out of a desktop model, and the cables to the motherboard are too short to allow me to mount it in the correct place. A temperature logger kit available from from Ozitronics kits. By chance, I had seen this at Linux.conf.au in January 2004, though I already knew about it before. 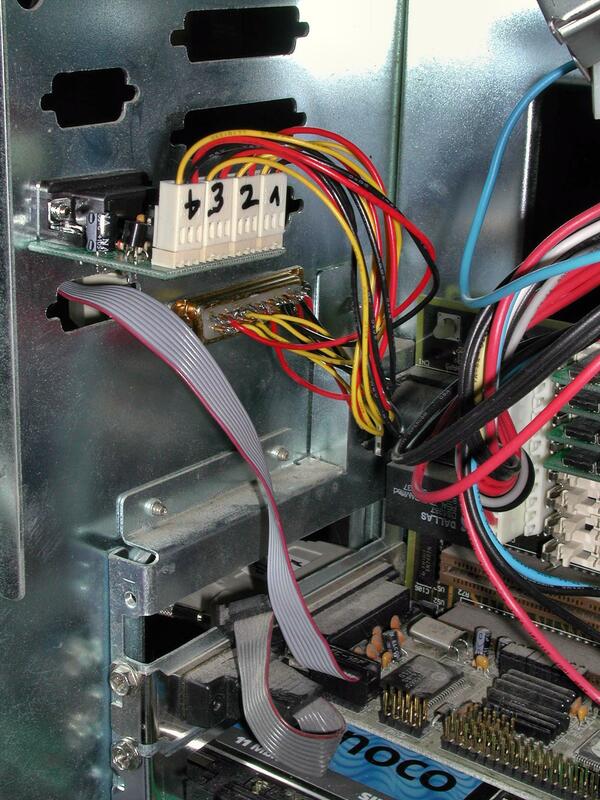 It connects to the system via the serial port. A relay board also available from from Ozitronics kits. It connects to the parallel port and controls up to 8 relays with up to 250 VAC and 10 A, though they recommend additional wiring for currents of over 5 A. A fridge typically uses a maximum of 3A, so this is of academic interest only. This one shows the temperature probe assembly. There are no mounting holes on the probe board, so I had to mount it by its 9 pin serial connector. I had already connected to probe cables to a 25 pin connector. I wanted it inside the case, so I had to connect the flat cable to the serial port on the outside of the case (the grey cable going out through another cutout just below the probe board). I need to find some kind of plate that I can use to mount it inside the case. 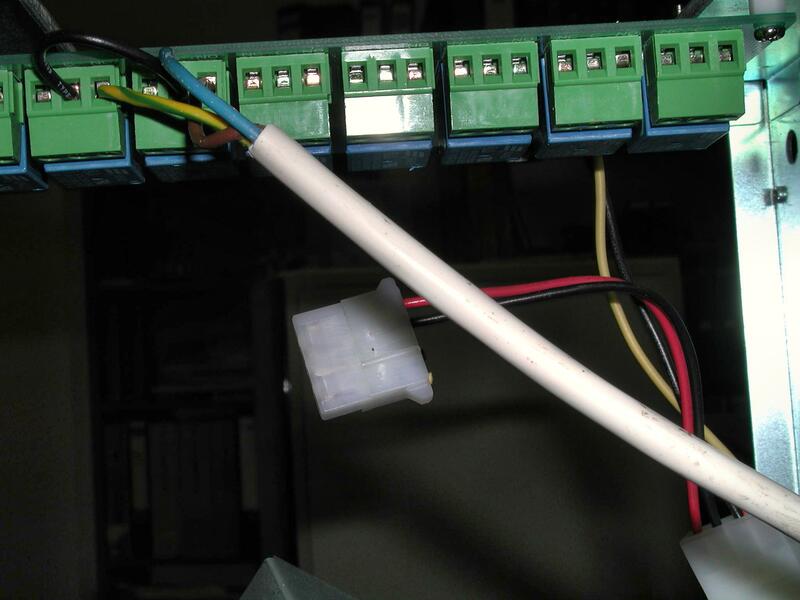 This shows the 12V connection to the relay board. I mounted it from the top of the cabinet, and the 12V input is from the computer power supply. 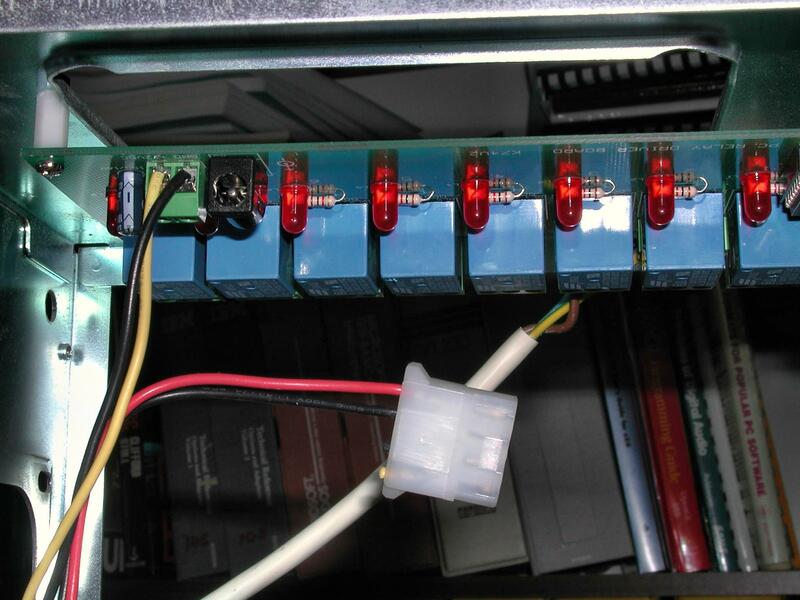 This one shows the other side of the relay board with the mains power connections. 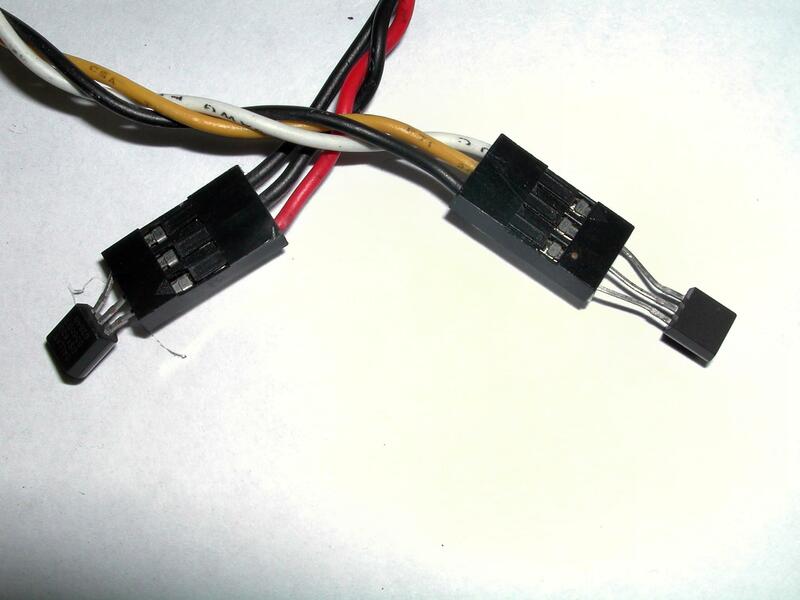 The lower cable goes from the parallel port back inside to the relays. It would be nice to have internal cabling, but I don't know of any parallel ports that connect to a header on the board. They're all connected directly to an external connector. Above that is the temperature probe cable, as shown before. Higher and to the right, the flat band cable mentioned previously. At the top are the relay power outputs (white) and the computer power cable (black). 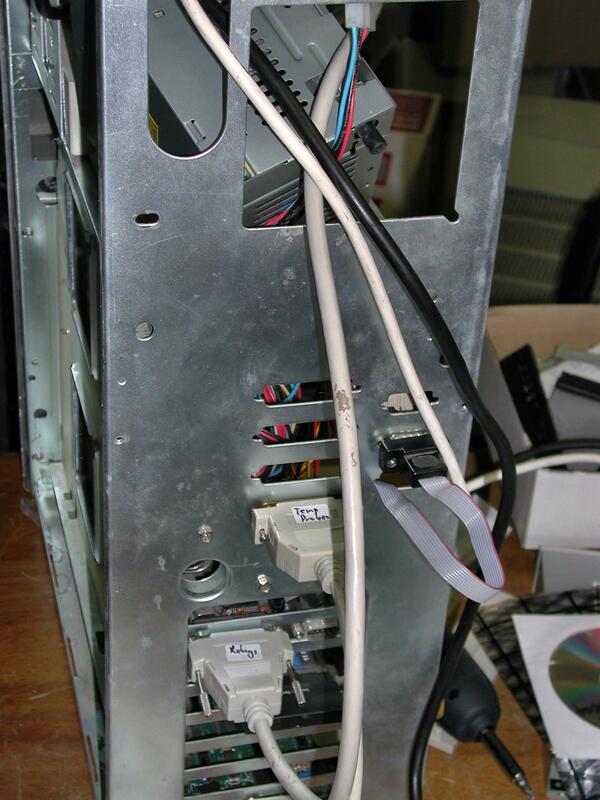 The power supply is in at an angle because it was originally designed for a smaller case, and the internal cables are too short to allow normal mounting. Some time I must buy a proper power supply. 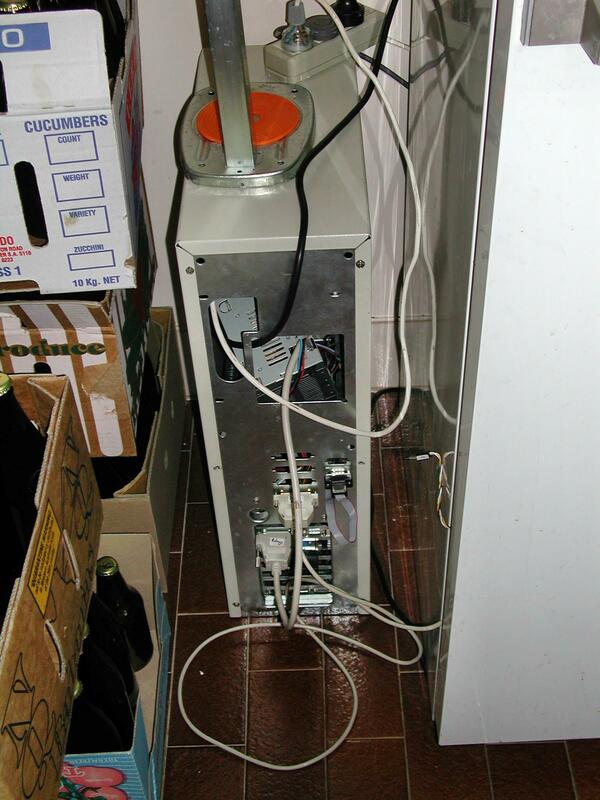 The external (“room”) sensor is on the side of the fridge, not an ideal place, especially when I replace the power supply, when it'll be in the exhaust area. To be relocated. The internal (“ambient”) temperature sensor is barely visible in front of the 25 pin connector. It's fastened to one of the bars of the grille. The wort temperature sensor is taped to the outside of the fermenter. It's covered with some bubble foil to minimize the effects of the ambient air. The fourth sensor is intended for a second fermenter. It's hanging down in front of the light. It's possible that somebody will try to compromise this system via telnet. They won't succeed, but if they bombard me with enough traffic, it'll be expensive anyway. If this happens, I'll remove the facility. X axis: Time. This should be the local time (Australian CST, 9½ hours ahead of UTC in winter, 10½ hours ahead in summer), but currently it's still showing UTC. 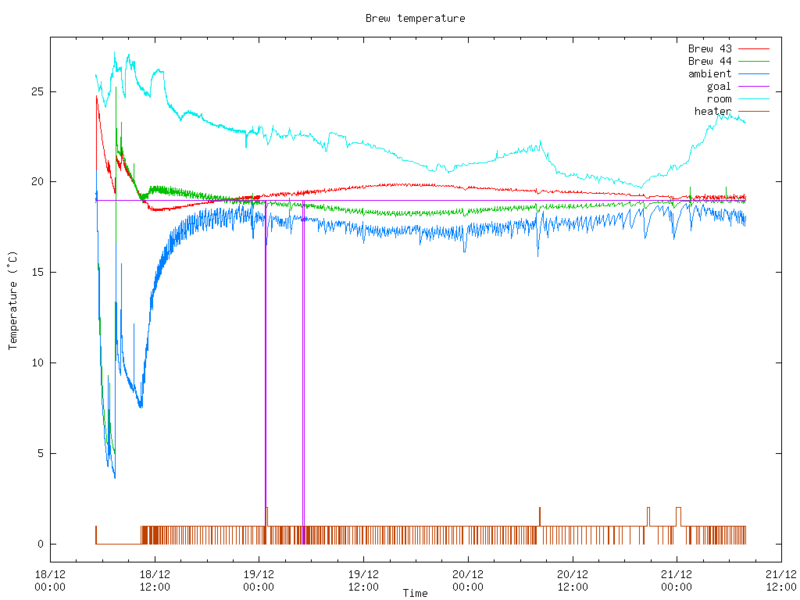 Red line: Temperature of first brew (Brew 43 in the example, but this will change). Green line: Temperature of second brew (Brew 44 in the example, but this will change). 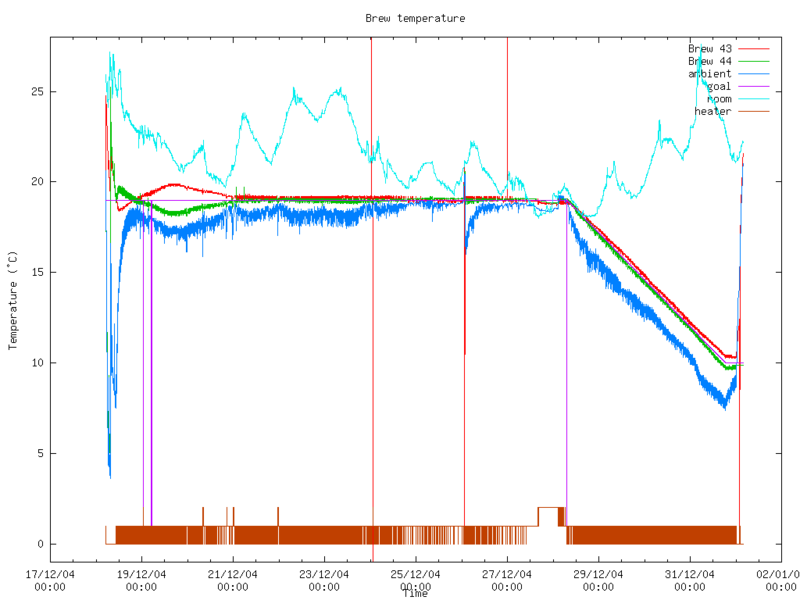 Dark blue line: Ambient temperature in the fridge. This is the temperature of the air that cools or warms the beer. Base: The temperature that is being controlled. This is somewhere between the temperature of the first and the second brews, depending on what I have told the program. In the example it's fairly clearly the temperature of the first brew, but this will change depending on what I'm brewing. It's very often the average of the two. This information is supplied in the text version only. Purple line: Goal: The temperature that the wort should achieve. Offset: The difference between the base temperature and the room temperature. This information is supplied in the text version only. Cyan line: Room: The temperature outside the fridge. This is purely informational; it (currently) isn't processed in any way. Brown line: Indicates whether the system heats (line up from centre) or cools (line down from centre). If you hear of any others, please let me know and I'll update the list.